Restore the beauty of your smile with a dental crown from Sarasota Dentistry. As we get older, our teeth begin to change and are prone to decay. Whether it is a cavity, an accident, or natural wear-and-tear, there are many possible reasons for this change in your smile. These reasons can include bruxism (teeth grinding), general decay, cracked fillings, root canals, and many others. If your tooth is beyond repair with a filling material, we may recommend that the best viable option to save the tooth is a full crown. The reasons for this type of restoration in a badly damaged tooth are durability, cosmetic appearance, and overall support of the chewing function. Dr. Hank Michael has been practicing cosmetic dentistry and utilizing state-of-the-art dental crowns to restore patients’ smiles here in Sarasota since 2001. Year after year he is recognized as one of the top dentists in Sarasota, due to his (and his staff’s) commitment to their patients and to perpetual learning. If we decide that you are in need of a full crown, there are a few different options for the repair of your tooth. These options include a full porcelain crown, porcelain fused to metal or gold, or a full gold crown. Dr. Michael encourages metal-free crown restorations which includes the all-porcelain crown. Our crowns are created using state-of-the-are materials, the best of what is available. There are a variety of options for patients when it comes to the construction of dental crowns. EMPRESS and EMAX are two of the highest quality porcelains for crowns, and we offer both here at Sarasota Dentistry. EMPRESS are strong and aesthetically pleasing while EMAX is the closest to enamel in terms of strength and protection. We also offer LAVA and PRETTAU zirconia, which are porcelain fused with zirconia to increase strength. Often this material is used in bridge construction or dental implant cases, because it offers greater strength and resistance to chipping. We will help you to make the determination as to which of these three options is the most appropriate for your situation. You can be comfortable in knowing that your new tooth will be virtually unnoticeable and will flawlessly complement the rest of your smile. Once you have decided to proceed with a dental crown restoration, we will set aside 1-3 appointments for the entire process. Although the majority of crowns are completed in one visit, there are sometimes a need for 2 or 3 visits depending on the number of crowns needed. Smile makeovers generally take additional visits so the patient has time to try out the smile before it is permanently positioned in the mouth. The appointment takes about 90 minutes for a CEREC same-day crown. 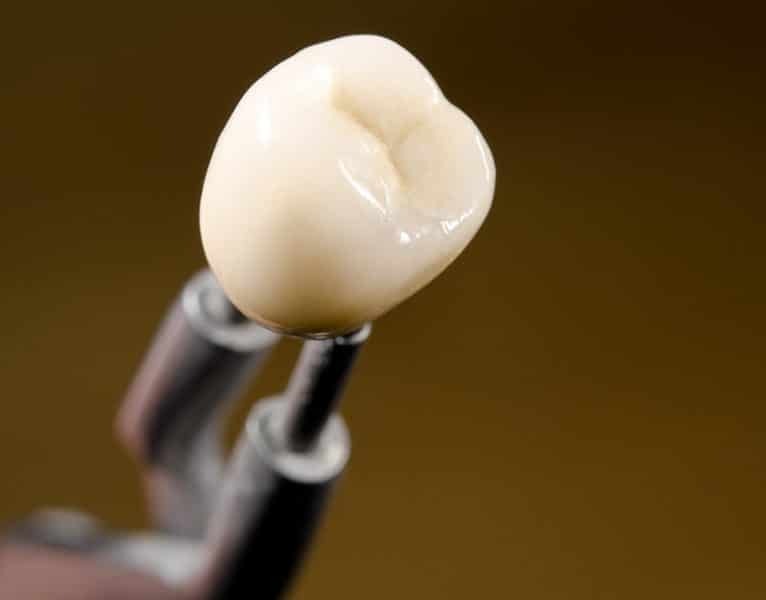 The procedure begins with the removal of all decay and the shaping of the tooth structure to allow it to fit the crown. Once we have removed the decay and shaped the tooth, we will take a digital impression of the tooth using the CEREC camera. This digital impression is instantly transferred to the chair-side CEREC computer where your new restoration will be designed in about 5 minutes. It is then transferred wirelessly to the crown milling station where it is cut from a block of porcelain. If the patient doesn't have any additional treatment necessary, they now have a 30 minute break where they can watch TV, read, or watch the ongoing crown fabrication process. Finally, the crown will be fitted comfortably into the mouth. We will make every effort to ensure that the new tooth feels exactly like one of your natural teeth. The final step in the process is to cement or bond the crown onto your tooth, leaving you with a beautifully restored smile. What is a specialty dental implant crown? One very common specialty crown is the dental implant crown. While it is usually fabricated in the same way as a traditional dental crown, it may require additional preparation with models and temporaries prior to fabricating the permanent crown. The dental implant crowns are placed on a dental implant abutment (custom or prefabricated) rather than a tooth and these many times require additional steps to enhance the soft tissue (gums) around the abutment for a more cosmetic result. Another common specialty crown is a splinted dental crown. How are splinted dental crowns different from normal ones? Splinted dental crowns are two or more dental crowns fabricated together as one and placed over two or more individual teeth making them one. Some dentists refer to these teeth as "bridged" rather than "splinted". There a couple of reasons you might need splinted crowns. One reason is a mobile tooth/teeth. Splinting the teeth together as one makes them more stable. The other, is a drifting tooth which leads to a food trap. This happens when a patient has a tooth removed and doesn't replace it with a dental implant or bridge. The teeth drift and move resulting in a food trap. Splinted dental crowns solve this problem by maintaining the position of the teeth tightly together, therefore preventing food trapping. The cost of a dental crown varies depending on your situation -- but the range is generally from $1300 to $2000 per crown. Often, your dental insurance will cover a portion of the cost. Our dental staff will help you determine whether or not your dental insurance will cover the costs. We are willing to work with patients to help understand your dental insurance and we also provide financing options for those needing a payment plan. Dental crowns can last for a period of five to fifteen years depending on the maintenance they are given. The lifespan of a crown will largely depend on the level of wear and tear you subject your crown to, your diligence in adhering to recommended hygiene practices, and your individual mouth related habits. Since the mouth system is quite complex, the longevity of your crown will be determined by many factors most of which you have control over. With proper care and good habits, your crowns can last for up to 30 years or even more. To extend the lifespan of your crown, ensure that you uphold hygiene routines such as brushing your teeth two times every day and flossing at least once per day, avoid biting fingernails or chewing hard candy, ice or other hard objects. You should also avoid grinding or clenching your teeth to prevent cracking your crown and also attend dental checkups and cleaning on a regular basis for examination of signs of decay, gaping between the crown and the tooth and even trauma. Mouth guards or night guards can also be helpful in extending the life of your crowns and preventing cracked teeth. How do you clean dental crowns? Properly fabricated and installed dental crowns should be treated just as though it is your natural tooth. Your dental crowns require thorough cleaning for them to last long. The first thing is to brush your dental crown after every meal. This prevents food particles from building up and seeping inside the crown resulting in a bacterial infection. You should use a soft-bristle toothbrush, in circular motions, aimed at a 45-degree angle towards the gum-line. Many surfaces of a crown are self-cleaning during the eating process. The gum-line is the problematic area that is susceptible to decay, stain and recession. The surface around the dental crown should be brushed gently with a lot of care to make sure the bristles of your toothbrush are against the gum that surrounds the crown. Another way to clean your dental crowns is to gargle using fluoride mouth rinse. Swish the rinse thoroughly inside the mouth for about one minute, then spit it out and use cold water to rinse your mouth. Doing so will dislodge any particles from the crown hence reducing the growth of bacterial infection. Finally, ensure that you clean between your crowns at least twice per day. This can be done with dental floss by placing the floss on either side of the crown and pulling it gently forming a “C” shape around the tooth. Avoid using a sawing motion or exerting excessive pressure on your gum since this may cause unnecessary pain and trauma. An alternative, or adjunct, to floss is an interdental brush. Interdental brushes are more effective in many cases since they have a true scrubbing action and can care fluoride tooth paste into the spaces and push food and bacteria out. Floss is limited due to the slick surface. Another effective interdental cleaning technique is the use of an oral irrigator such as the Waterpik. If you are a dedicated patient wishing for the best results, use the Waterpik first, then brush with fluoride tooth paste, then, (while the tooth paste is still in your mouth) use the interdental brush and/or floss in between the teeth. This will insure the most effective defense against bacteria that cause decay and gum disease. Some people believe you should be more careful not to dislodge your crown, but the truth is quite the contrary. Your crown should not fall out, and if it does fall out during flossing or cleaning your teeth, it was going to fall out very soon on its own. It’s better to catch it during your routine dental care than to swallow it while chewing. How do you whiten dental crowns? Most crowns are made of porcelain which is highly resistant to stains. Since it is not easy to whiten crowns after installation, it is recommended that you ask your dentist to whiten them before installation. You should then clean the crowns properly to maintain their appearance, always floss or use a proxy brush after every meal to remove food particles that cause stains and buildup of plaque. If your crowns become due become stained due to age or even poor dental hygiene, you can seek a dentist for a professional cleaning or for dental whitening options. To whiten the crowns, a dentist uses a special whitening polish that helps to restore the original color of your crowns. If you feel that your crowns have served you long enough and have become discolored and worn out, it is recommended that you replace them. If your crowns become whiter than the natural teeth next to them, it is recommended that you use a whitening system to brighten the natural teeth. Due to the advent of teeth whitening through trays, tooth pastes, and mouth washes, many old crowns are now looking yellow compared to the natural teeth. These crowns need to be replaced with a color matching the whiter teeth.